In order for it to work efficiently, your heating system needs clean water flowing through it – This helps keep fuel wastage to a minimum too. Unfortunately, over time sludge can build up which creates blockages in the pipework and builds up in the radiators. This makes the boiler and pump work harder than it needs to. The result is wasted energy, higher fuel bills and you may be paying more to heat your home than you should! Power flushing is the fastest and most effective way to flush heating systems, and involves minimal disruption and dismantling. We use purpose built power flushing pumps, designed to cure the circulation and boiler noise problems caused by accumulations of sludge, corrosion deposits and scale which are found in most ageing central heating systems. The power flushing pump is temporarily connected into a heating system during the flushing process. The high water velocity, combined with instantaneous flow reversal, dislodges and mobilises sludge and corrosion deposits. Having loosened the debris, the pump expels it from the system to waste, using a high velocity flow of fresh water. Radiators are individually flushed without removal or disconnection from the system. After the power flush, the system is full of clean water, and re- instatement to normal operation takes only a few minutes. A power flush can be extremely effective in cleaning systems that have corrosion problems as a result of a design fault, but we strongly recommend that any such design faults be rectified before power flushing commences. The infrared images below were taken of a now healthy radiator immediately after a full central heating powerflush in a property in Kent. Powerflushing removes the built up sludge in the heating system – As well as improving efficiency, powerflushing reduces the risk of costly sludge related boiler & central heating breakdowns. How do your radiators perform? 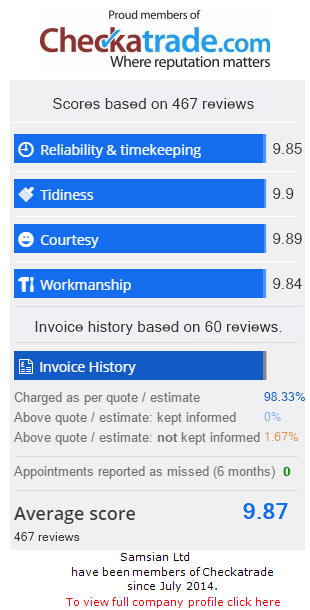 Use our quick power flush quote tool or Call 01732 885882 now for a competitive powerflushing quote or ask our engineer for a more details when he visits.